It's just another night as usual for Dr Gonzalez working the graveyard shift in the ER. Another battered young thug left for dead at the hospital doorway, another patient the police make clear they'd prefer not to survive, another in Gonzalez's months-long list of patients failed. And then things all go to hell. The door bursts open with the frantic arrival of a gang of colorful thugs, the feared Nafta Super (Super Gasoline) gang with their leader, Pinino, unconscious and bleeding out in open defiance of the local legends that portray him as literally unstoppable. Gonzalez's instructions are clear: Keep Pinino alive until morning no matter what. When morning comes he will be fine. But if Pinino dies, so does Gonzalez.And, oh, there's the little matter of the police massing outside the hospital doors to ensure Pinino dies well before daybreak. And somewhere around here something begins to twig in the mind of the viewer as they watch Nicanor Loreti's adaptation of Leo Oyola's novel. There's something about the appearance of the rest of the Nafta Super gang ... the tiara-wearing transvestite with the star scars on her shoulders; the fast moving punk with a lightning bolt shaved in the back of his head; the leather clad biker. And, yes, what you are thinking is correct: Loreti (following Oyola's template) has gone all Watchmen with the Justice League here, reshaping the popular super hero team into a gritty, down and dirty form that reflects what would happen if a group of people with these unique powers were to meet in the dark corners of Buenos Aires. And so, welcome to the world of Kryptonita, a world where the mightiest hero - Nafta Super - has a fondness for lighting his enemies on fire and can only be felled by shards of green glass from a broken beer bottle. A world where the authorities are so corrupt that the only way to help the masses is to hold to your own criminal code of honor and where the police employ a man remarkably similar to The Joker as a hostage negotiator while attempting to assassinate criminals at the paid behest of other criminals. 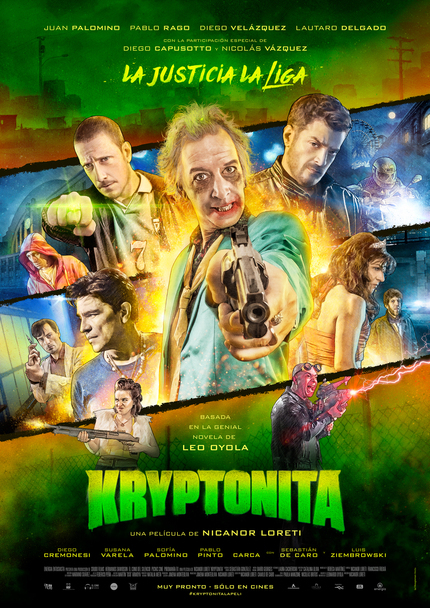 Kryptonita is a film that will almost certainly play radically differently to local and international audiences. To the locals there is certainly a certain delight in seeing these international icons subverted and localised in the name of satire, a degree of novelty coupled with wordplay and jokes clearly meant for the local audience that will not translate well for the international crowd. And for the internationals? Well, for the internationals this is a film that will be judged based on how well it meets the standards of the two principal genres it is mashing together - the superhero film and the siege film - and, sadly, it satisfies neither. Perhaps out of over-loyalty to the source material and perhaps as a simple consequence of budget limits this is a film that is overwhelmingly dialogue heavy, a film dominated by characters talking about amazing things they've seen and done rather than actually doing those things now on screen, and very rare is the person who will leave a superhero film that is ninety percent exposition happy. Similarly, on the siege front, those laying siege are virtually absent - our grinning negotiator appearing in only two scenes, the police no more than that - rendering this a siege film absent an actual siege and therefore without tension. The expected tropes of the genre are entirely ignored throughout the script, a move that will likely prove fatal for international audiences. That said, while audiences abroad may feel let down by the script, there's absolutely no denying that Loreti simply directs the hell out of each and every page. He's got an interesting cast of characters here and he handles them well. The art direction is superb and hugely stylized, every frame loaded up with brash, bold images. There is a very good argument to make - and, yes, I'm making it here - that of the current generation of Argentinian directors Loreti is the one most equipped to make the step into the international mainstream. His technical gifts are obvious, his style abundant, and his grasp of pop culture grammar clear. With Kryptonita it seems obvious that Loreti is still making a local movie for a local audience and time will tell how well it works in that arena, but when the time comes that he wants to broaden out his reach, well, look out because he's capable of great things. I havent seen it yet, but I am quite a fan of the book and I would be a bit dissapointed if it wasnt a "local movie for a local audience"
We see so many international (aka USA) movies that I really want to see something different in local people´s works.